ISIS has discovered images of an Iranian site that raises suspicions that Iran is continuing to hide parts of its nuclear program. These images were provided to ABC News for a June 16, 2004 World News Tonight report. 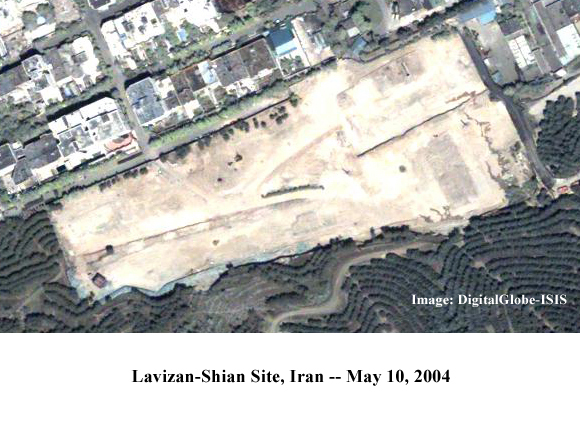 The site in Lavizan-Shian, a northeastern neighborhood of Tehran, has been under investigation since 2003 by the International Atomic Energy Agency (IAEA), the United States, and likely other governments as a potential undeclared nuclear or nuclear-related site. Adding to suspicions, while these investigations were ongoing the buildings were dismantled, rubble carted away, and the ground was scraped between approximately the first of the year and March 2004. The IAEA is continuing to investigate and will likely soon request a visit to the site. 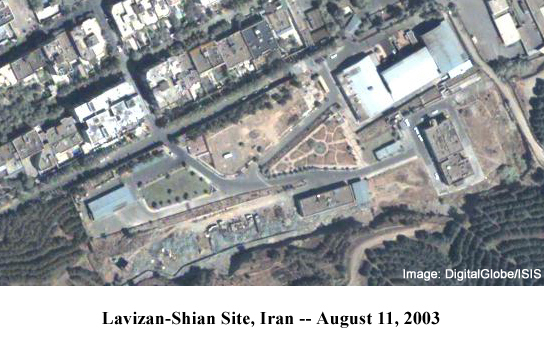 This site first came to public attention in May 2003 when the Iranian opposition group, National Council for Resistance of Iran, announced that the site, called the Lavizan-Shian Technical Research Center, was associated with biological weapons research. They said the Center was affiliated with Malek-Ashtar University and was formed under the Ministry of Defense. Later, a radiation detection device, called a whole body counter, was discovered to have been delivered to the site from overseas. The equipment itself is not direct evidence of a nuclear weapons program, but it is out of place at a site that was not declared by Iran to have any nuclear activity. Spare parts for the machine were also known to have been sent to the site. These additional pieces of equipment may actually have allowed modifications to the whole body counter that would make it more useful for a nuclear weapons program. However, the actual purpose and current location of the equipment remains unknown. 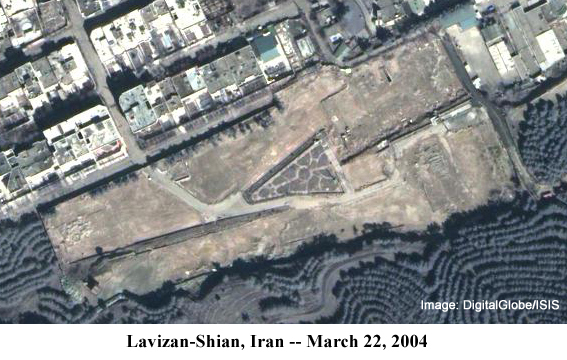 The site was photographed by DigitalGlobe’s Quickbird commercial satellite in August 2003 and March 2004. The first image shows large buildings inside a secure perimeter. In the second image, the buildings were removed and the earth scraped. Even the roads and walkways were removed or covered. To see the images together, click here. This destruction at the site raised concerns because it is the type of measure Iran would need to take if it was trying to defeat the powerful environmental sampling capabilities of IAEA inspectors. At other sites, less extensive deception measures were employed by Iran, but the inspectors nonetheless discovered traces of enriched uranium, revealing details about activities at the sites and leading Iran to revise its declarations to the IAEA. NEW: Image from May 10, 2004.